Paper Wings. Rosemary Clewes. Guernica Editions. Essential Poets Series 215. Toronto - Buffalo - Lancaster (UK). 2014. 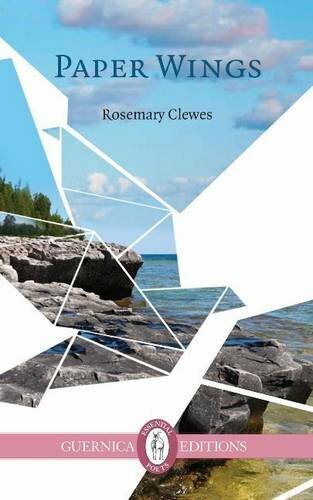 Rosemary Clewes got my full attention when she Tom Thompsoned into poetry her kayaking experience in Georgian Bay. Then she turned all eloquent Billy Bishipish and flew me into World World I with her father. These were both excellent maneuvers. Clewes writes with a thorough clarity that has you instantly involved and invested in her narrative. These narratives travel, visit the arctic, fall in love, age graceful and curious. you might notice the absence of twitter. sun's hesitation amongst the ferns. This is August after all. for the sea, the eleven mile beach of light & light. puddles a Quasimodo at your feet. the geometry of light is incalculable. There's an epicene beauty peculiar to shadows. shade's voluptuary, flaring hips over sand. Sundown's elongations are dying to go home. your shadow's shadow filling up with moon. like stories you tell about yourself. You have told so many, you think you know who you are. Clewes tells us "the geometry of light is incalculable" but that doesn't stop her from showering her considerable light in calculated measures sure as a metronome. Today's book of poetry was touched to my fragile heart by how Rosemary Clewes understood water from a kayak's point of view. Kayaking is a relatively new experience for me but Clewes gives words to the most eloquent of my own imaginings in such a way that I am both jealous and grateful. Milo read the flying poems this morning and imagined himself all Snoopy and Red Baron, he imagined himself airborne. Kathryn read the kayaking poems and is now doing a google-search for everything else Rosemary Clewes. After this morning's read Kathryn quickly nixed Milo's flying lesson plans and told him that they were going on a kayaking trip this summer. Neither of them asked me about holidays. Milo has never been away from electricity but he has also yet to say no to Kathryn. I read the other poems and it was my pleasure. Paper Wings is from Guernica Editions "Essential Poets" series and Today's book of poetry couldn't agree more, every poetry collection should have some Clewes in in. the green reach into shadowed boulders. quivers on the crooked field of stones beneath my bow. the sedges, the silt and swimming things. Put me inside that too. The gills, the cyclopic eye and the still mouth. Today's book of poetry is now a Rosemary Clewes admirer. We're pretty sure that anyone else who picks up a copy of Paper Wings is going to be an admirer as well. This is smart poetry by a witty and wise woman who sees the universe with optimism. There's no sentimentalism in the Clewes canon but there sure is a lot of grace. You died, and then I dreamed we were young again. crushing against your blue serge suit. the disc jockey played to wind up another holiday ball. How you noted my name. Today's book of poetry was thrilled to be introduced to Rosemary Clewes and Paper Wings. Clewes struck me as someone I've been reading my entire life, or should have been, that's how natural her voice feels. TBOP felt like Clewes had been giving the low-down all along. We're sure glad she's come along. This sort of charm and experience doesn't come along nearly often enough. 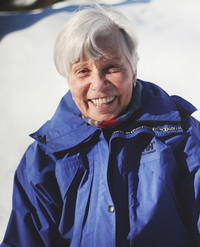 Toronto poet Rosemary Clewes is the author of two books: Thule Explorer: Kayaking North of 77 Degrees(2008) and Once Houses Could Fly: Kayaking North of 79 Degrees (2012). In 2005, she was nominated by The Malahat Review for The National Magazine Awards and, in 2006, a finalist in the CBC Literary Awards. She has made seven trips to the Arctic, travelling by kayak, raft and icebreaker. Paper Wings is born in the ground of the Bruce Peninsula and then hovers above its landscape like a hawk, surveying rock/shore/tree magic, moving into the imagination, the spirit, other landscapes, all the way to the Yukon and the High Arctic … Using her intense language and the white page in original patterns, Rosemary Clewes goes beyond what is real or what isn’t into the poetry of the spirit, the great journey. It’s a book of power and energy and image and rhythm and prayer – and marks her immediately as a poet to watch. Here is a poet utterly taken by the universe, by the created world, natural and human, in all its glory and with all its artifacts, its deep and delicate mysteries. Her lines cut a clean kayak-path through the waves and currents of experience. Her words, with disarming ease and grace, pilot through the skies of the Great War with a father long dead, and perform surprise tangos on the gravel bar of a northern river. These poems are talismans for keeping the ordinary, extraordinary.